So with a Star Wars podcast coming up tonight. 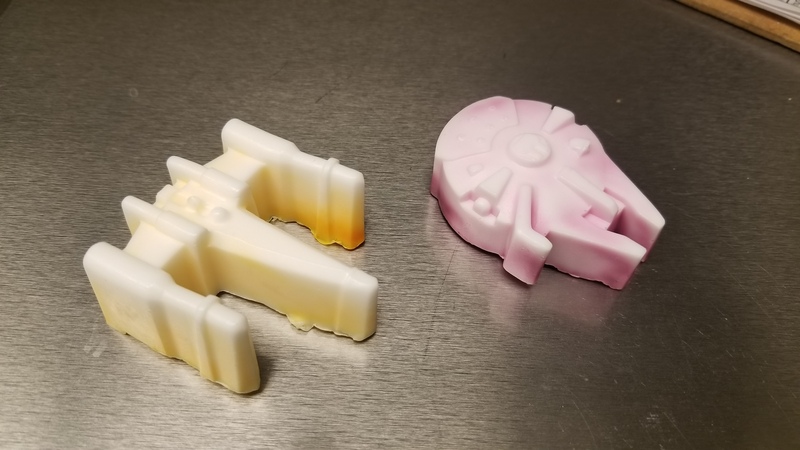 Plus with The Last Jedi riding high, figured I’d share something one if my coworkers made. They are rather a amazing I must say haha. One smells like coffee and the other is a lavender base. I’ll make a post later sharing December’s Geek Fallout podcasts plus the Holiday Special! So earlier I shared a few pictures I got with DC’s Joker, Batman, Catwoman and Harley Quinn. 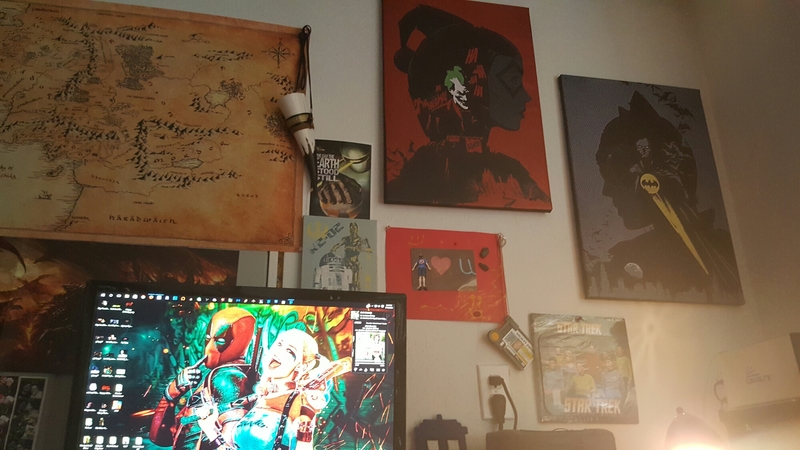 Finally found a spot for them! 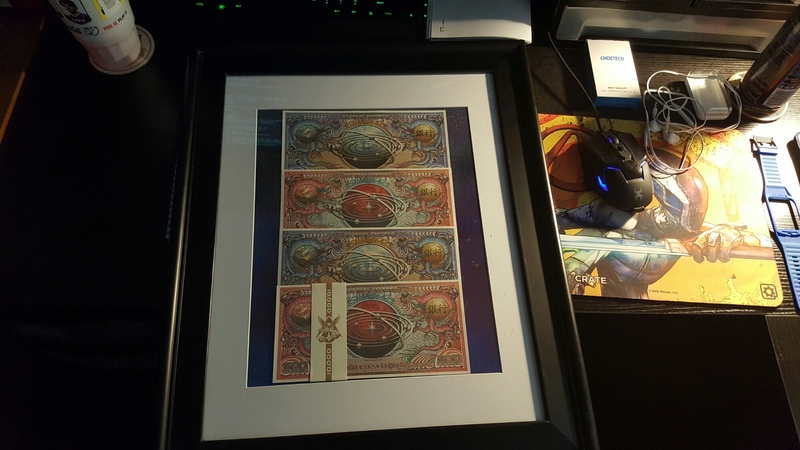 I also framed some currency from Firefly. I liked how it come out, plus I got to play around with spray paint and made a background for it :). I meant to post this earlier last month. But with work and some medical issues coming up. I almost forgot. I know I shared some of these pictures on Twitter and Facebook while everything was going on. Oh I should tell you I’m talking about my kids birthdays, haha sorry! Anywho, there was so much more going on and so many other cool pictures that I wanted to share with you all. For Jackson’s 7th birthday, he wanted a Star Wars themed birthday. So my wife made this awesome cake with lightsabers made from Rice Krispie treats. One was red and the other was blue, of course we had a whole slew of decorations how we found over the years. Plus some new ones :). Before the party I made these DIY lightsabers out of water noodles. Cut them in half and used duct tape along with electrical tape for the hilt. Made one for each kid, so they can run around and beat on each other and not have to worry. In the background we had all the Star Wars movies playing all day, even found the Ewok movies to play haha. As well as music :). Over all the birthday was a hit and everything went smoothly. Jackson was rather happy and got a lot of cool toys. Now on Lilly’s 9th birthday(or should I say 9 3/4) she wanted a Harry Potter themed birthday. This one was a bit more difficult to do. There isn’t really party theme items you can just pick up at the store. Or that they cost an arm and a leg to get. So this birthday was about 90% DIY… Again my wife made an amazing cake that was Potter themed. She also made wands for all the kids. I made a banner using photoshop and found some Potter themed jellybeans. Also made some floating candlesticks with LED candles in them. We also had some flying keys that were made for our wedding awhile back. So we reused those. We had a flying snitch and my wife made some lighting bolts out of plastic beads. I later made some butter beer and chocolate frogs. As well as little chocolate broomstick and with the extra melted chocolate I we made a 20 sided die haha. Like the Star Wars birthday, we had all the Harry Potter movies playing all day. By the time everything was done.. I believe we both pasted out from all the work that was put into all this. It’s okay tho, because it made for some really good memories and also ideas for other parties that might come our way. All finished #DIY #SuperMario #nes #nintendo #plasticcanvas what should I do next?